Being busy seems to be the epitome of the good life. We are told always having something to do is important. Being productive all the time is considered necessary to be happy. In truth, there needs to be time to simply sit with your hands folded. Time to stare into space without focusing on any one thing. Just sitting by yourself doing nothing. This is when your mind wanders wherever it wants. It is when the outer world recedes and your inner world plays. You hear music only you can hear and see beauty only you can see. Doing nothing prepares you for something you will do. Doing nothing helps you find what only you can accomplish. The something that the world can only receive from you. You will do many wonderful things in your life. Things that one person or maybe the whole world needs to have done. While doing nothing you will find your purpose. Be someone who takes the time to do nothing to find where you belong. Yes, I believe we are beings with unique parts to play. I think there are many basic reasons for our being here that are common to all of us. I also believe that there is a reason for each of us that is a paramount purpose, something that is ours alone to accomplish. I think we are here to love and be loved, to work, contribute, and serve to make the world a safe, healthy, peaceful home for all. How we do this is determined by our skills and abilities, education and beliefs, dreams and aspirations. Some may do many things and others may have few accomplishments. Some may make big important discoveries or inventions and others may live quiet unassuming lives that seem small in comparison. But all of us are needed in some way. As for our paramount purpose, it may be of major importance for all the people of the world or for just one person. Some may know what their purpose is and some may not. Some might know the what and when and where and who of their purpose, however, I believe most do not know. What we know or don’t know doesn’t matter. We could accomplish our assigned task early in life or on the last day of our life. I doubt anyone leaves this earth without fulfilling their purpose. but do I know what my principal purpose is? 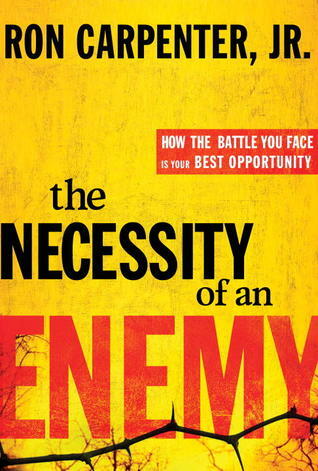 The Necessity of an Enemy by Ron Carpenter Jr.
Ron Carpenter Jr. is senior pastor of Redemption World Outreach Center in Greenville, South Carolina. He and his wife, Hope, founded the church in 1991. Today the church has over 16,000 members and 150 community outreach programs. Their ministry includes television and web programs and more than 1,500 affiliated churches worldwide. He is a successful man who learned that enemies are necessary because we have our part and purpose in God’s plan. God uses enemies to strengthen us, test us, build our vision, and to help us become who He has purposed us to be. There are seven parts to the book that Carpenter wrote after his own difficult time battling the enemies the Enemy put in his path. Parts one, two, and three tell us why the enemy is necessary, who is really in control, and that being a target in the enemy’s sights is a blessing. Parts four, five, and six tell us where enemies enter our lives, what weapons are used by the enemy, and there is always an enemy on the prowl. In part seven there are lessons on how to fight. In conclusion, part eight tells us about the next thing…the spoils of victory. Victory in a battle does not mean there will not be other battles. The spoils of victory are to be acknowledged and enjoyed but our guard and focus must remain and we must be alert. Carpenter writes of the enemy that came into his life and set him spinning. His experience and what it cost him, taught him, and how it gave him a clearer vision of who he is and his part in God’s plan led to the writing of this book. 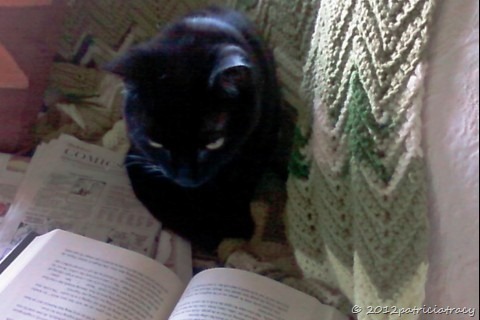 What he writes is challenging and he sometimes is brash and can sound arrogant. But he encourages the reader to face the Enemy and do battle in spite of weaknesses knowing it is all part of God’s plan and purpose for us all. I received this book from WaterBrook Press at no cost to me in exchange for this review.